Nissan's turned up the heat on its full-size family hauler, bringing the big, lovable, body-on-frame SUV back with a full redesign. Following in the footsteps of Pathfinder, Murano and Rogue, the 2017 Armada is the final model in Nissan's SUV lineup to receive a complete makeover. Armada's new exterior styling is emboldened. Its LED lights are now angular and more pronounced, and the grille is notably more prominent, as are the front bumper and fog light designs. It's elegant yet rugged on the outside and powerful under the hood, where there's a new Endurance V8 engine. Also notable, the 2017 Nissan Armada in Albuquerque offers a new suite of safety technology. Called well-equipped in many 2017 Nissan Armada reviews, this eight-passenger SUV offers a wealth of features, including Nissan Intelligent Key, remote start and a power liftgate. On trips to school and across country, a Family Entertainment System provides fun for backseat passengers, with rear-mounted dual-screen DVD monitors, USB ports, VTR jacks and wireless headphones. 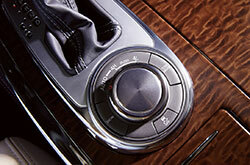 Plus, when you need a soundtrack for the road, Armada's plethora of audio features are at your command. From SiriusXM Satellite Radio to CD, MP3 and more, your music needs are covered. This year's trim levels include the SV, SL and Platinum. When you visit Reliable Nissan to test drive the 2017 Nissan Armada in Albuquerque, ask your associate for full details about each trim's standard features. 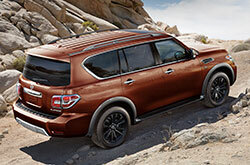 Standard on all Nissan Armada models, a new 5.6L Endurance V8 engine offers enhanced horsepower - 390 hp - compared to the preceding 317-hp engine. Torque is also up, hitting 401 lb.-ft. at 4,000 rpm. The new V8 uses a Direct Injection Gas system and Variable Valve Event & Lift technology for optimal performance and efficiency. Replacing the five-speed automatic transmission, a new seven-speed automatic is now tied to the engine; it incorporates Adaptive Shift Control and Downshift Rev Matching, which also boost efficiency. Safety is mentioned in several 2017 Nissan Armada reviews and for good reason. 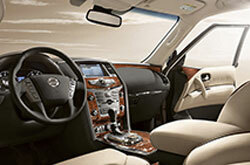 Front, back, and from side to side, the Nissan Armada provides all around protection. 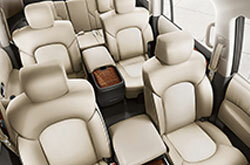 Along with its durable structure and standard safety features, the SUV offers technologies like class-exclusive Predictive Forward Collision Warning, Intelligent Cruise Control, Forward Emergency Braking, an Around View Monitor and other technologies that enhance peace of mind for families. 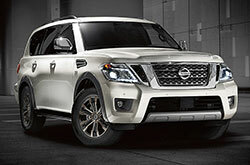 The Nissan Armada Is Finally Here! If you've been shopping for new vehicle models near Albuquerque like the 2017 Toyota Sequoia, Ford Expedition and the Chevrolet Suburban, then you should not hesitate to view the 2017 Nissan Armada. Thanks to its luxury in-car technologies and other characteristics, it could end up being a terrific match for you. Utilize our review and test out the comparison tool to see if the 2017 Nissan Armada is a fit for your day-to-day needs; and after, check out finance incentives available at Reliable Nissan. 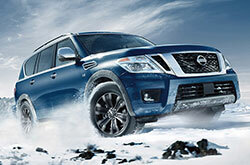 Among our truly incredible range of cars, the Nissan Armada is a hot-ticket option at our Nissan dealership. We hope the specs in our 2017 Nissan Armada review will be worthwhile when you make your final purchase decision. Check out new Nissan Armada models at Reliable Nissan - sending a request for a test drive online is streamlined using our email form. Would you like a chance to see it preceding your visit? It's no problem - looking at the enclosed video walk-around will give you a peek at its exterior and interior from all angles.